I daaaa, otvori više fejs za blog, ti mi tamo baš fališ :) go go go! Bas ti hvala :) Sako sam kupila prije 2 godine i jos uvijek je kao novi + svaku kombinaciju ucini elegantnom. You know I love the coat, but the red jacket is adorable. I love your style, Natali! You are stunning! I was just wondering if this bag is too heavy? I saw it in the shop and it felt really heavy, but I was wondering what you think as someone who already has it and uses it! Mi piace molto il rosso! Great outfit, that coat is beautiful, I love how you styled it! 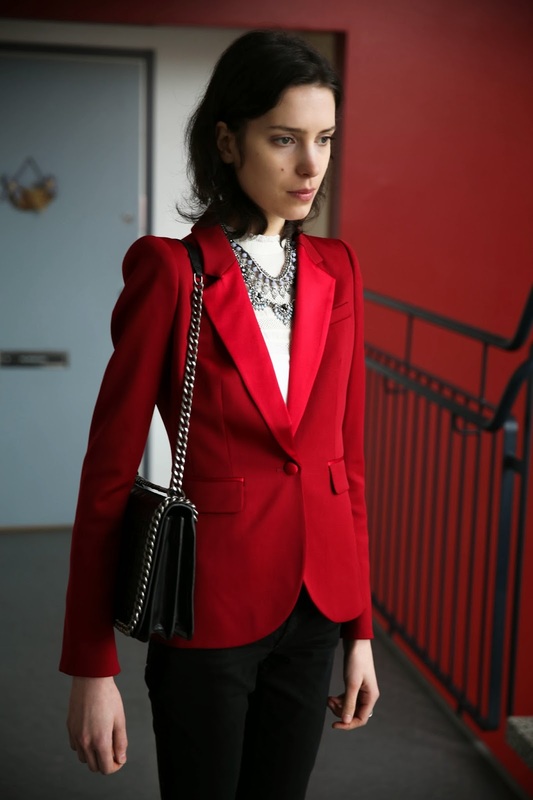 The structure of that blazer is perfection! Great styling! Gorgeous outfit! One of my favorite color combos! So cute look! Lets follow each other? You look amazing. Wish to check out my blog and maybe follow each other? Let me know. Amazing photoshoot! Check out my new photoshoot on my blog! Stunning Pics & Beautiful Blog! Looking sharp in that red blazer! And love the scarf and the acne jeans! So glad I clicked on your comment on THEBLONDESALAD and got led back here to yours. By the way, I just posted my new layering (step-by-step) post on how to style some old CÉLINE floral trousers and make them new new again. Check it out to see how many layers does it take to get to the juicy center haha! the first picture is amazing! red/black is such a hot combo! ja nemam fb, ali pošto većina ljudi ima, mislim da je dobra ideja da ga otvoriš. ovo je stvarno prekrasno! obožavam crvene sakoe, našla sam i jedan za sebe prošlog ljeta i još sam sretna zbog toga. Ugodan ostatak vikenda! p.s. uključujem tvoj outfit u sljedeći post (outfite tjedna). You look absolutely gorgeous) This combination of white, black and red colors is my favourite) Lovely snapshots as well! You keep surprising me with your beauty! Thank you dear, you're so kind! What a beautiful chic look! Stunning. Gorgeous necklace. Such a statement piece.